So, I was stood around in the kitchen. Nothing particularly exciting, my other half was working on making tea and I was chatting to avoid doing chores. Anyhow, it turns out that I have slidey socks. But of course to do this, physics had to push my legs forward, so that I ended up karate kicking the kickboard under the oven, leaving it with a huge crack. I'm actually quite pleased with this in a way, because I've had a hate-hate relationship with the kickboard, it's not fixed, just balanced upright so whenever you stand near it it takes the opportunity to topple forward onto your toes. Plus, my son thought it was a great opportunity to climb into my lap, which was very cute, but made standing up even more difficult when my socks were still attempting to replicate ice. Anyway, a video I wanted to flag up to everyone is Nyan Cat. This is a geek cult video, referred to in The Guild's music video "I'm the one that's cool" (another great video to watch). If you haven't seen it before go watch it. Basically either you'll turn it off after ten seconds or your brain will melt. 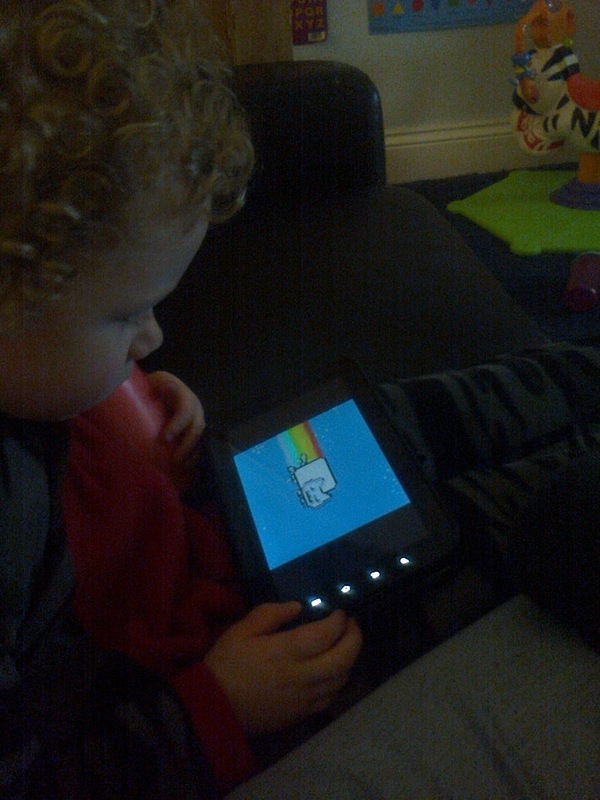 I probably ought to be reported to someone, because I let my son watch it on my tablet. We'll see what condition he's in tomorrow.